If you didn’t brave the polar vortex last week for LegalWeek 2019, or maybe you’re still on a runway that’s just finally thawed, we went, we froze, and we’ve got the highlights for you. Discussions of AI, e-Discovery, data management, and diversity dominated the conference in NYC. Here are our top 5 takes from this year’s LegalWeek conference. Wendy Butler Curtis, Orrick’s CIO (Chief Innovation Officer), sits down with LegalSpeak to discuss how technology will create new career paths in the legal industry. Wendy posits that LegalTech shouldn’t be seen as a threat to legal careers. Technology may close one door, but opens diverse new paths (and jobs) to address and solve the challenges of FutureLaw—especially roles that involve project management, data management, and strategic decision-making. GC’s are still demanding data from their outside counsel, and many law firms still are not delivering. Gina Passarella, Editor-in-Chief at ALM, questions whether firms really feel it’s in their best interest to parse the data and present it to GC’s, which may account for the continued tension. One of our favorite legal innovators, James Goodnow, flips the script and interviews Gina on the other trends she’s seen during this year’s LegalWeek. GC’s on a LegalWeek panel about Technology and Diversity said they weren’t aware of technology that assists in their, or outside counsel’s, diversity efforts. They must have missed our recent podcast on ETL, Hire an Esquire is the only legal staffing provider with a track record of improving diverse hiring with technology. Diversity demands from in-house departments to outside counsel was a frequent topic of discussion this week, especially on the heels of the open letter from 170 GC’s last week demanding that firms embrace diversity and inclusion or lose their business. 4. ...And a Robot Fight?! ROSS Intelligence decided to announce the launch of their new product, Eva, a direct competitor to Casetext’s CARA. Egged on by #lawtwitter, ROSS Intelligence’s CEO, Andrew Arruda and Casetext’s founder, Jake Heller, arranged for a good old-fashioned AI-off in the Hilton Hotel bar. People elbowed their way into the Hilton Bar to rachet up the tension and Bob Ambrogi live-streamed the competition.Check out the blow-by-blow tweets complete with Above the Law’s signature snark. 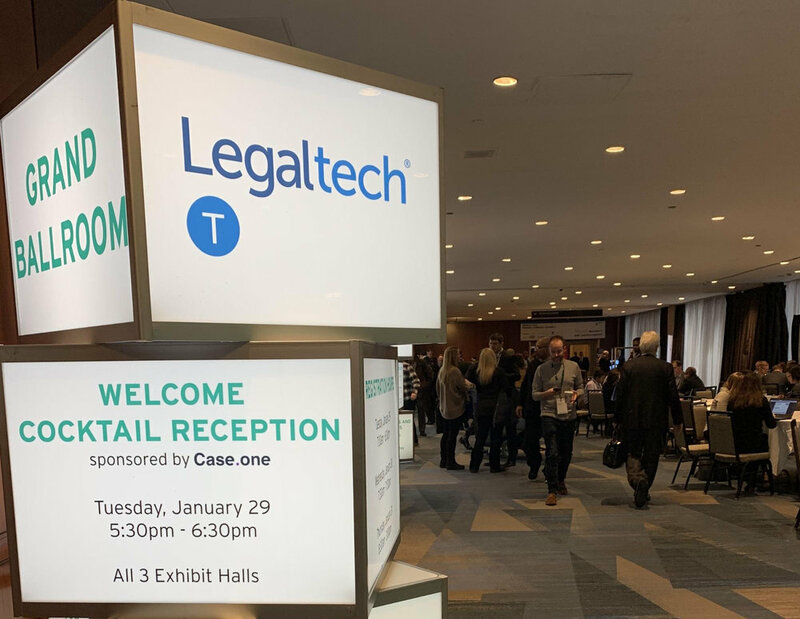 LegalWeek has historically featured a lot of e-Discovery technologies and this year was no different. Conference goers were greeted by 7-foot Disco ads in the style of New Yorker cartoons ($83 million really bolsters an ad budget) from the revolving door entering the hotel to every pillar inside the lobby. The e-Discovery technology landscape is competitive and changing rapidly with several major acquisitions in 2019 already. We’re predicting that the exhibit floor will continue to be dominated by eDiscovery sponsors—especially as the trend of other companies skipping booths altogether in favor of other options adjacent to the Hilton seemed to grow stronger; a lot of space previously used for booths was re-purposed into seating areas this year.